The twin girls fight frequently. They have a close, but tense sibling relationship. Katie tends to be the dominant one, and often takes advantage of her sister Kallie. The nature of their fighting was taking a toll on their closeness, and their words and actions increased at a hurtful momentum. Their frequent conflicts were getting more and more negative attention from their parents and another sibling. As I (Lynne) coached the mom and daughters, we came up with a fairly simple plan. It’s so practical! I now share it as a tool for other parents. Keep reading to equip your own kids with a vision and some concrete conflict resolution ideas, whether with siblings, or with friends. Magic markers to the rescue! By drawing pictures that fit the principles, the girls made concrete plans. For “COOL DOWN” Kallie drew a picture of herself reading and Katie of herself playing with toys. For “UNDERSTAND EACH OTHER” The girls worked together to draw a picture of one person talking and one with really big ears listening. 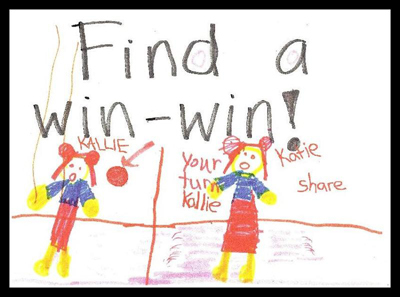 And for “FIND A WIN-WIN” they together drew a picture of them playing nicely together. These drawings of their future success established a simple vision for getting along well. What’s my best way to get calm? How have I settled down before? What did I feel? What did I want? What did my sibling (or friend) feel and want? How have we solved this kind of thing before? How can we best solve this right now? How could we each feel honored and respected by the solution? 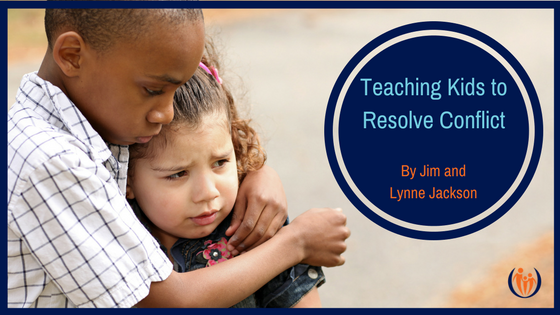 Working on these skills helps a child to form an identity as a learner and a reconciler instead of as a troublemaker or aggressor. It helps parents and children alike become more accountable to constructive conflict resolution as they grow in confidence and experience.